There is more to janitorial services than mopping a floor. New technologies and environmental concerns have taken commercial cleaning service to the next level. Jani-Clean combines today’s technology with more than 48 years of experience which means we can provide you a wide array of solutions based on your needs – at one site or for multiple locations. Why are Jani-Clean Janitorial Services the favored choice? We are the 24/7, 365-day provider for all your commercial cleaning service needs – whether you need an ongoing maintenance program or a one-time service call. If you require multiple services, even in multiple regions, we will provide expertise for commercial cleaning service conveniently under one contract. No surprises. Beginning when you request an estimate, you tell us what you expect, and our pricing is based on meeting those expectations. You will learn how to reduce unnecessary costs and get a fair price for our services. You can be sure that your money is being wisely and carefully spent. A reputation among employees as the company to be with. Our trained, uniformed workers use the best equipment and superior cleaning products for doing the job right. Exceptional work is reinforced through thorough record keeping, inspections, and reporting. Choose Jani-Clean for your janitorial services today. We look forward to the opportunity to serve you for every commercial cleaning service need! What Makes Jani-Clean Unique (and Superior)? Over 48 years of experience. A wide variety of building and commercial cleaning services. Jani-Clean leads the field in initiating the use of more efficient cleaning approaches. This includes environmentally responsible chemicals; simplified chemical mixing centers; light weight, maneuverable equipment; enhanced vacuum filtration systems; and a continual investment in specialized equipment. Tri-state coverage with experience in many industries, ranging from commercial and institutional to high tech and retail. Strict selection and hiring process. Our employees embody company values, and we believe in treating every person fairly and justly. Performance-based recognition, opportunities for advancement, extensive training, and competitive compensation, all increase service longevity and improve productivity. Our clients reap the benefits. Effective management tools. These systems increase worker productivity, facilitate communication, and integrate processes to measure the success of your commercial cleaning services. Environmentally responsible. 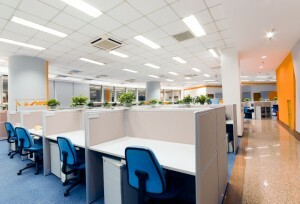 Our clients enjoy the advantages of green cleaning, which impacts employee morale and health, the company’s reputation and the bottom line. Discover how Jani-Clean can help your business.